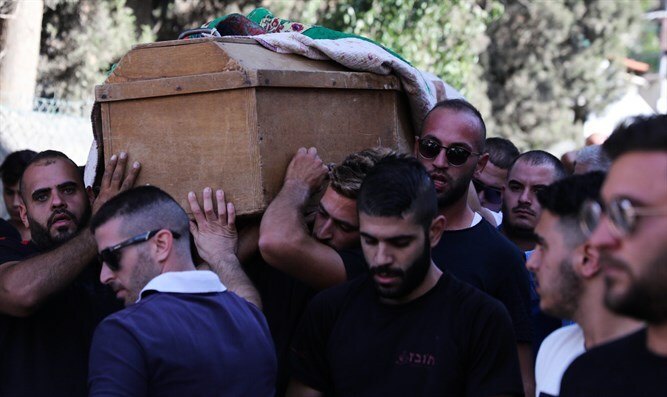 The three victims of the deadly terrorist attack at the entrance to the Jewish town of Har Adar Tuesday morning were laid to rest in the afternoon. Hundreds of people turned out to pay their last respects to Border Police officer Sgt. Solomon Gaviria, 20, who was murdered in the attack. Police Commissioner Ron Alsheich eulogized Gaviria. "Once again, the Border Police pay a heavy price for being on the front line. You, Solomon, were a man of values who put the State of Israel before yourself." At the same time, the funeral of Or Arish took place. Arish was a resident of Har Adar who served as a guard at the town gate. He was also murdered in the terrorist attack Tuesday morning. Earlier, security guard Youssef Ottman was laid to rest in his home town, the Arab community of Abu Ghosh. The funeral procession began at the Abu Ghosh mosque and from there proceeded to the cemetery. Culture and Sports Minister Miri Regev attended Ottman's funeral and said: "We woke up this morning for a horrible morning for your family and friends, and for all citizens. Two people went to work - one good and one evil. One loved life and the other came with weapons of murder. What a chasm exists between these two men,"
Opposition leader Yitzhak Herzog said at the funeral: "Abu Ghosh is the settlement of peace. Today a terrorist came to destroy the fabric of life here. We came from all over the country to tell you, Mr. Mayor, to the residents of Abu Ghosh, and to all the Arab citizens of the country - we have not allowed the terrorist to destroy what we built in Abu Ghosh. Despite the terrible pain, we believe we will overcome." The attack was carried out by Nimer Mahmoud Ahmad Aljamal, a 37-year old laborer from the nearby village of Beit Surik, who possessed a work permit enabling him to enter Har Adar. Jamal had aroused the suspicions of the security coordinator there who told him to wait. He then opened fire with a pistol, killing Border Policeman Solomon Gavriyah, 20, and security guards Youssef Ottman, 25, from Abu Ghosh and Or Arish, 25, from Har Adar. According to police, the weapon used in the attack was stolen back in 2003, and the Shin Bet security service said that Jamal did not have a record of being involved in terrorism. Investigators probing that attack point to the terrorist's troubled family life and a history of domestic violence. According to a report by Kan, Aljamal’s wife left him several weeks ago, moving to Jordan and leaving Aljamal to care for the couple’s four children.